To be honest, I had a hard time finding restaurants in Rome. Relying on online reviews turned out to be hit or miss. Stephen and I ate at quite a few restaurants that had thousands of 4 star reviews online only to be disappointed. Were our expectations too high? Were others’ too low? After a few more meals, Stephen noticed that we were having a much better time at restaurants with just a handful of excellent reviews compared to those with thousands. Le Tavernelle was one of the first restaurants we tried and our first data point. Atmosphere: 10 minutes from our AirBnb was a cluster of well-rated restaurants. We didn’t have a reservation for any and planned to try our luck at one of them. 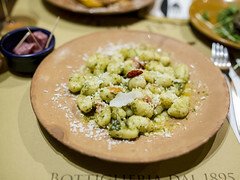 My first choice was a tapas spot (Ai Tre Scalini) but the queue was long and we were hungry. Le Tavernelle drew our attention across the street. After reading through their posted menu and being drawn in by the cozy atmosphere, we were able to get a table right away. Tables were nestled close together and the restaurant walls were covered with photos of famous diners and old posters. 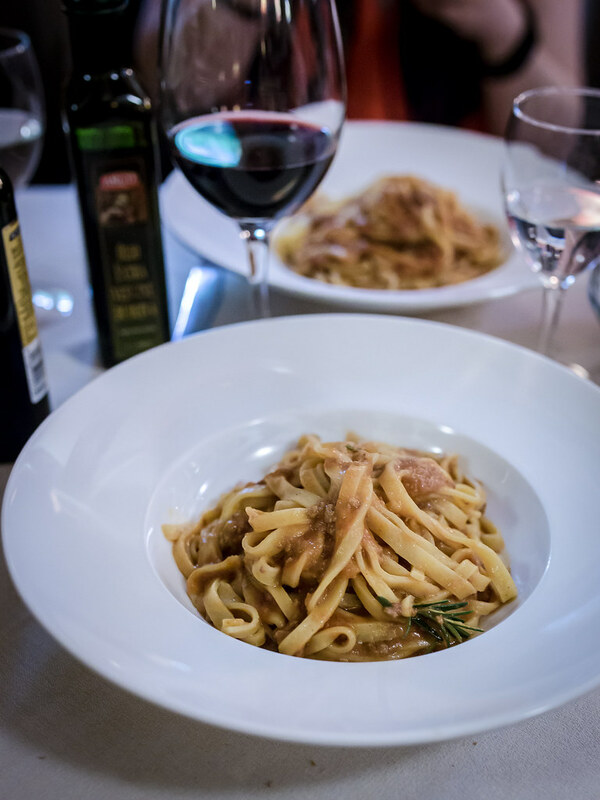 Service: While researching our trip to Italy, one of the main things I was warned about was ordering “water” in restaurants and being charged more than a glass of wine for sparkling water. Some nights, I did choose the sparkling but most nights we stuck to wine. At Le Tavernelle, we didn’t run into any communication issues with ordering but there was a bread charge included on the bill. Since tipping isn’t expected in Italy, I’m don’t have a problem with service charges, but really appreciate when they’re clearly communicated. Our server was professional and efficient and an English menu was available. Food: To start, Stephen and I ordered the Proscuitto with Melon. 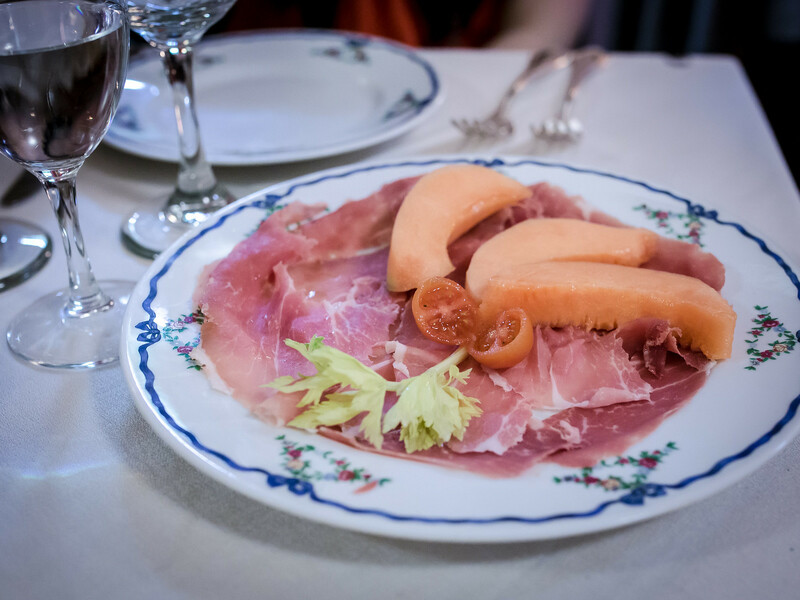 The cantaloupe was ripe and sweet and the prosciutto delicious. Both of us were set on pasta for our entrees and the two plates turned out to be very similar in presentation, but tasted very different. 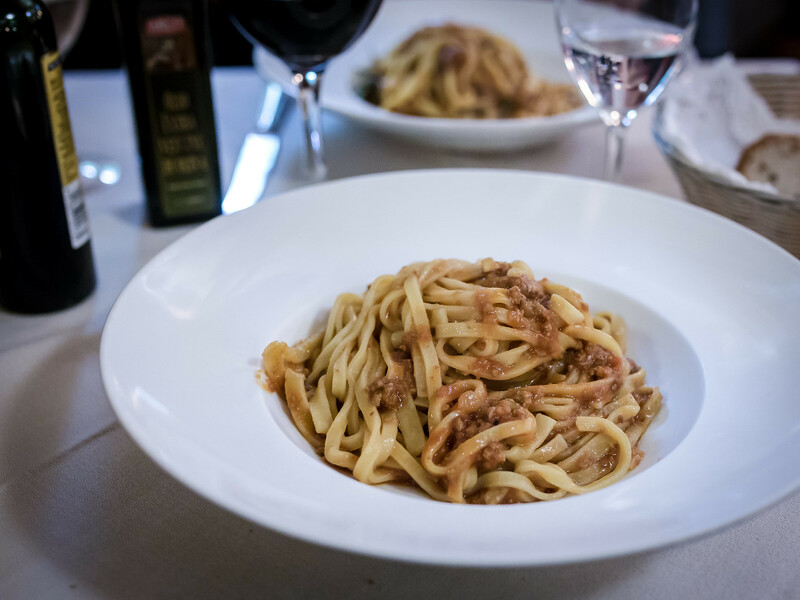 Stephen chose the classic Fettuccine in a Bolognese sauce while I opted for the Fettuccine with Wild Boar. Both pastas were tasty but between the two, mine won. 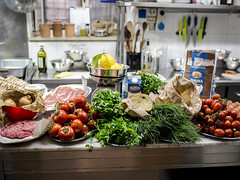 Stephen’s Bolognese had a rich tomato taste and was a touch sweet while my Wild Boar sauce was meaty, gamey, excellently seasoned and very flavourful. Both of us felt there was just more depth of flavour, but were very satisfied with each bite from either plate. 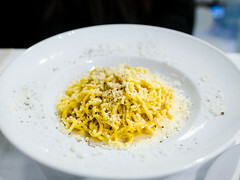 The pasta itself was cooked al dente, chewy and had a great texture. 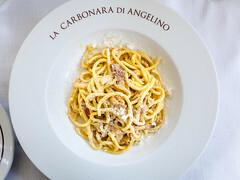 Overall, dinner at Le Tavernelle was delicious, comfortable and one of the best meals in Rome.